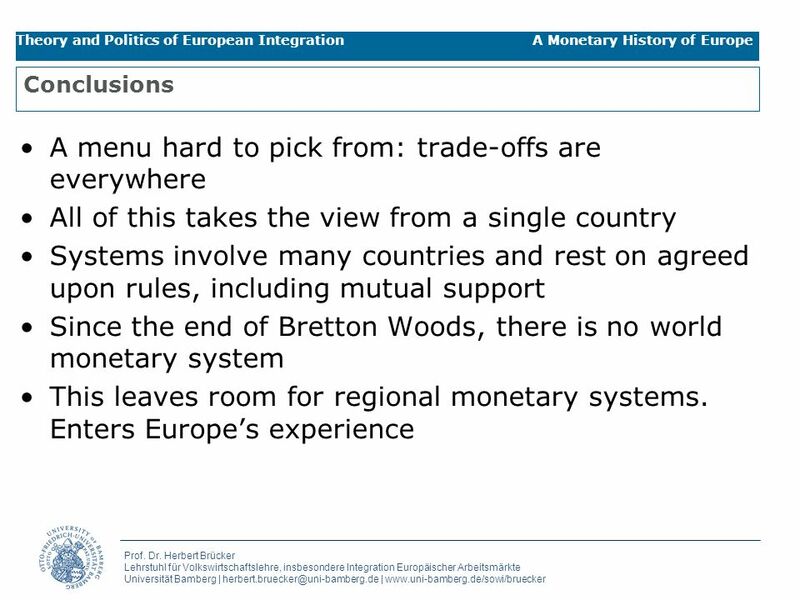 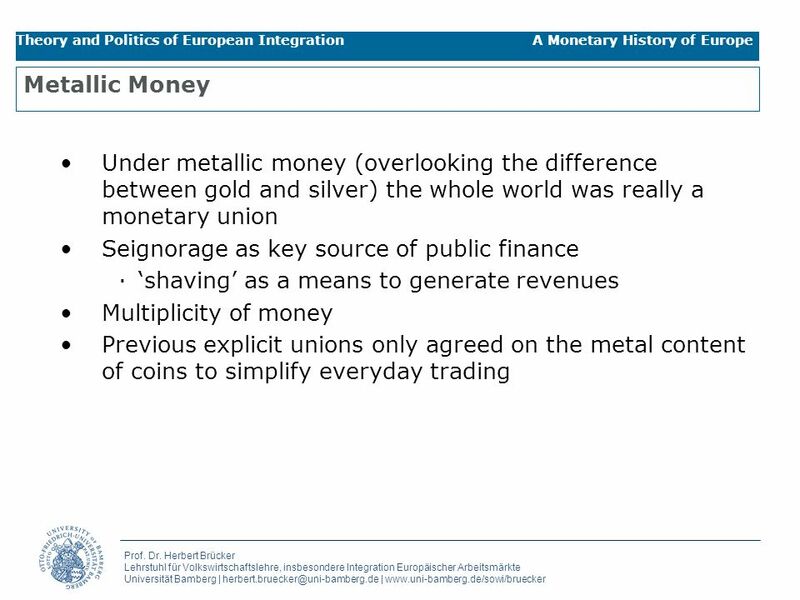 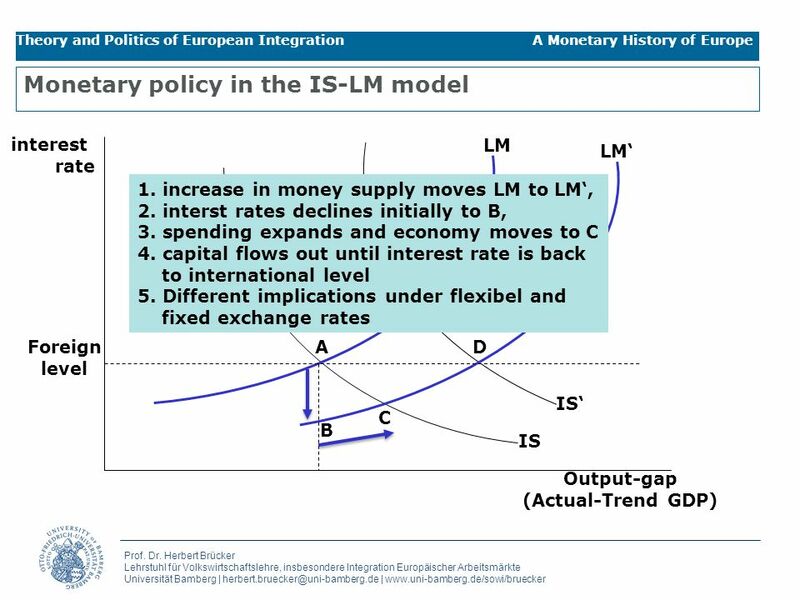 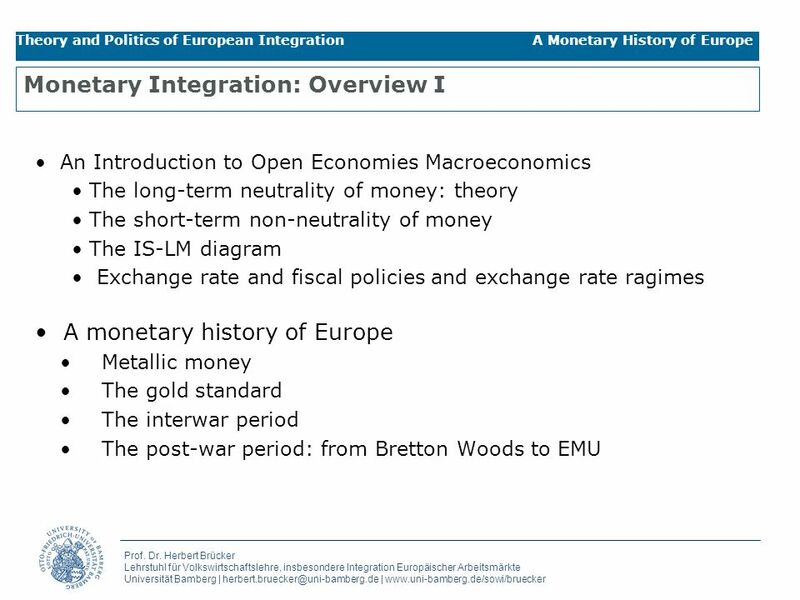 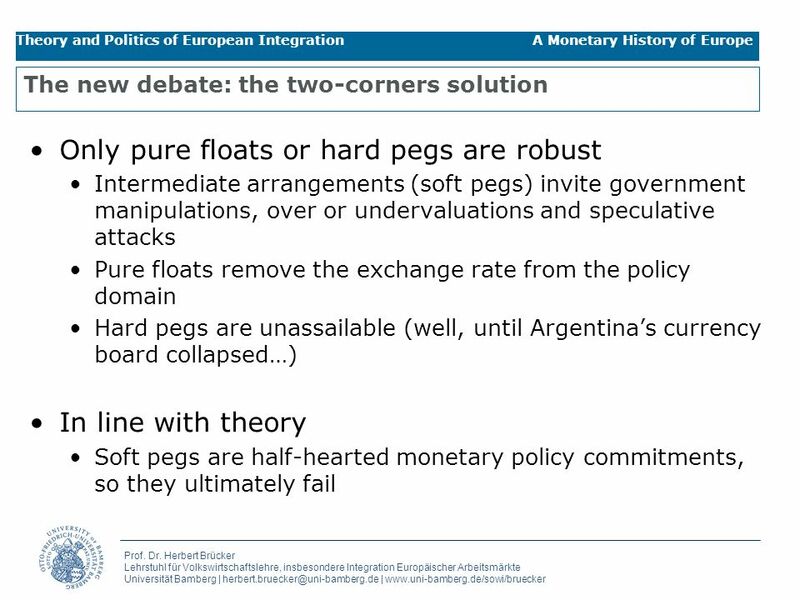 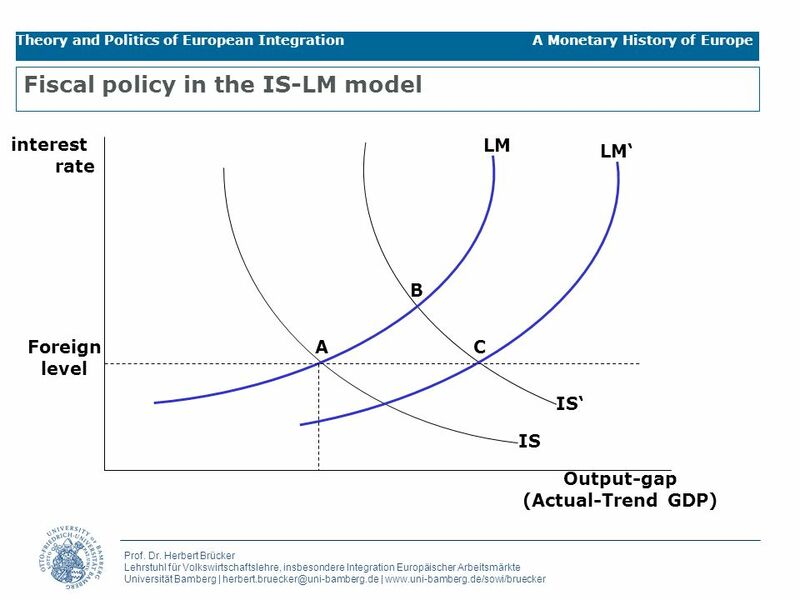 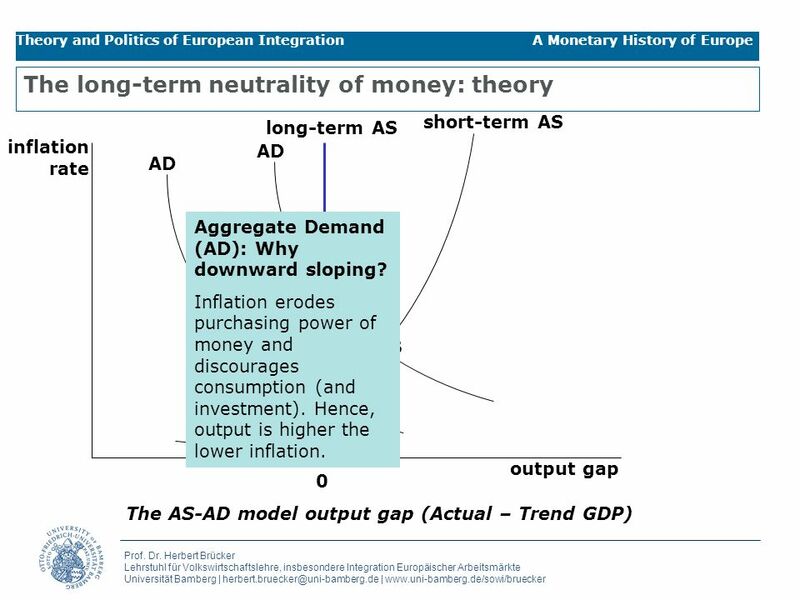 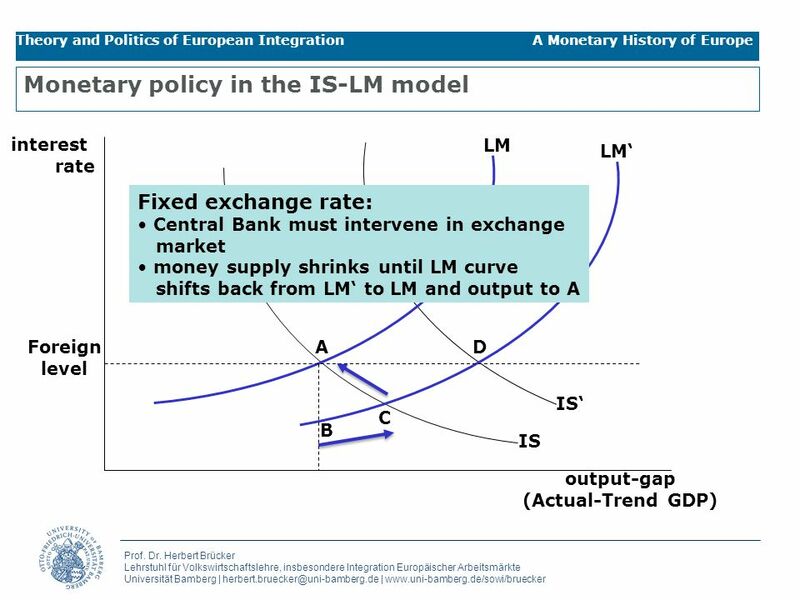 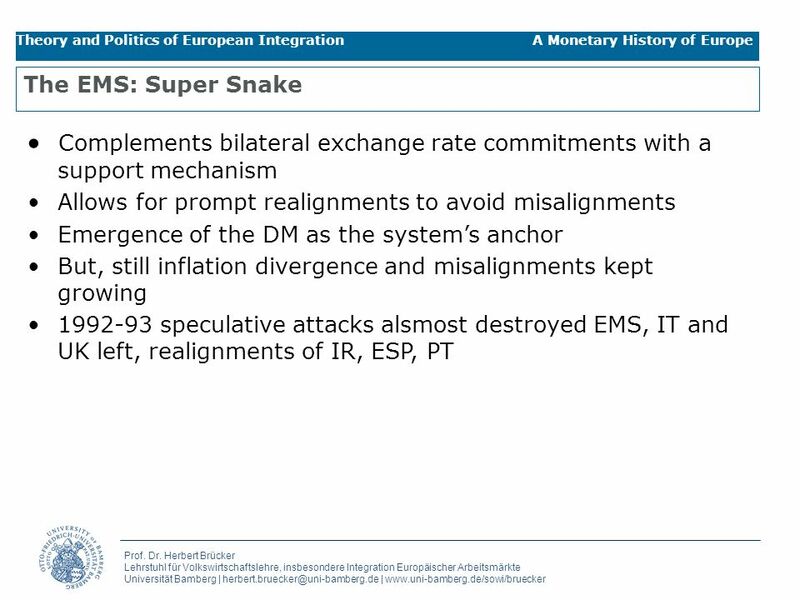 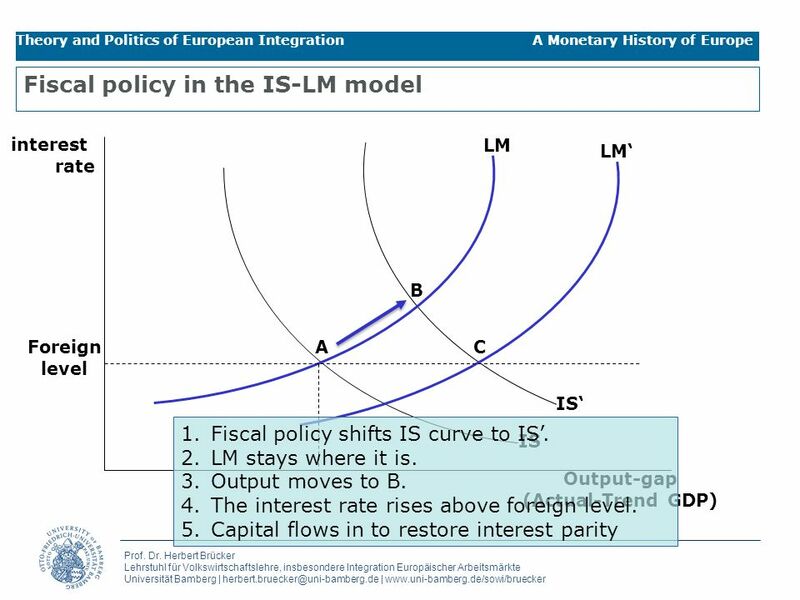 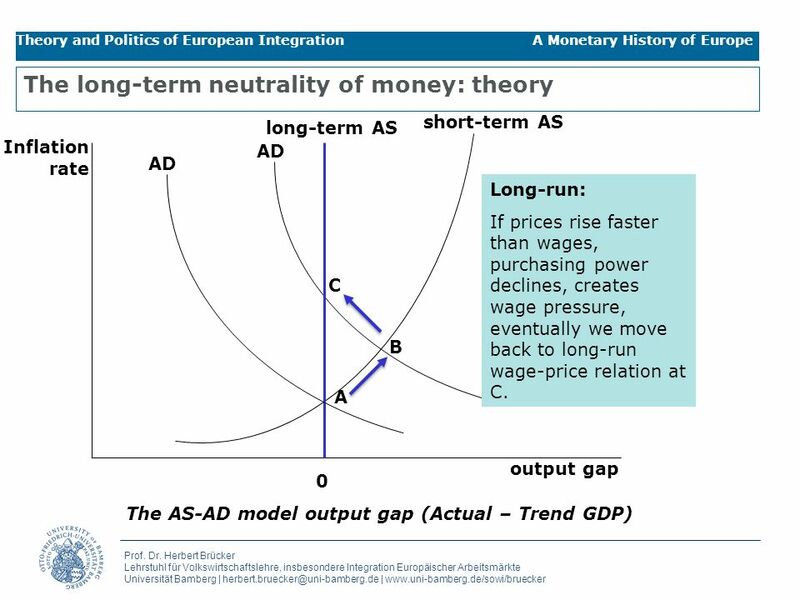 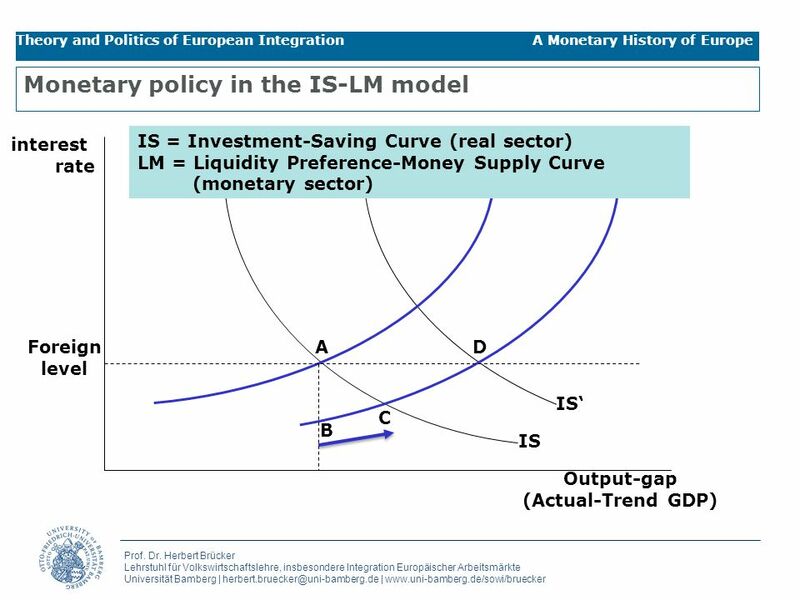 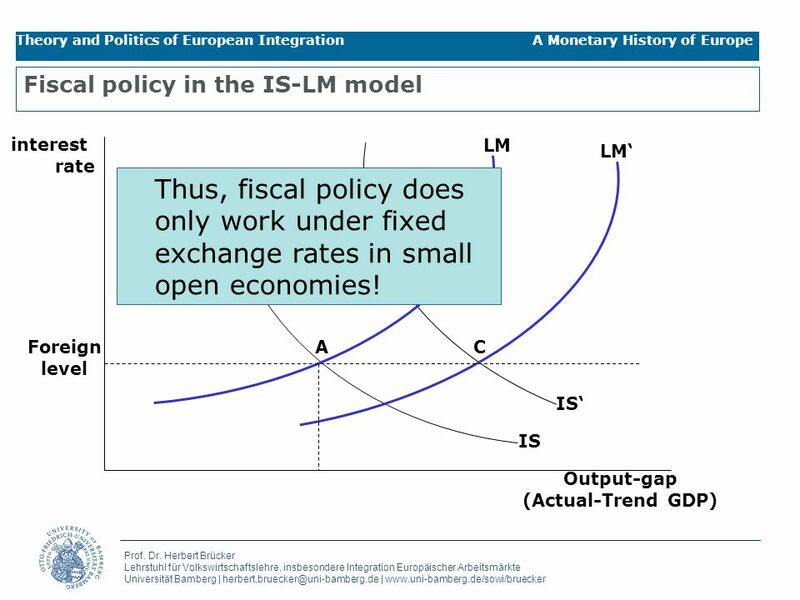 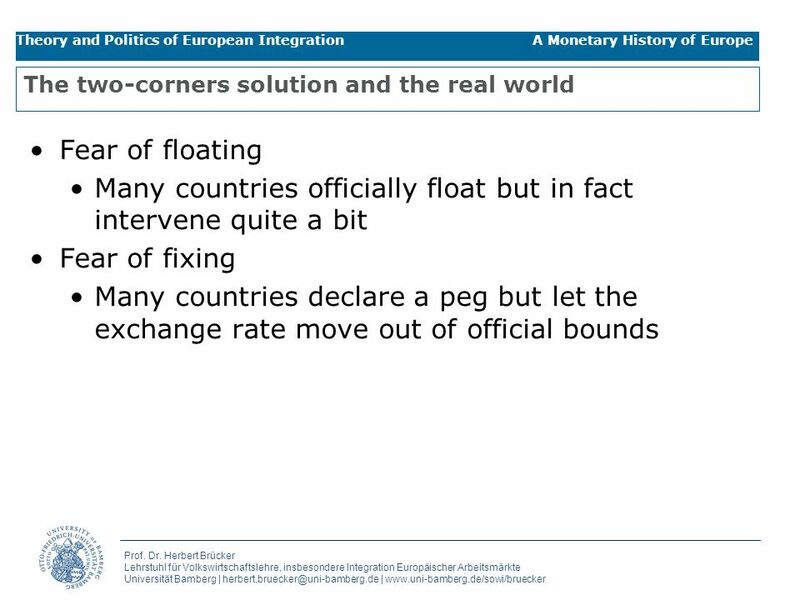 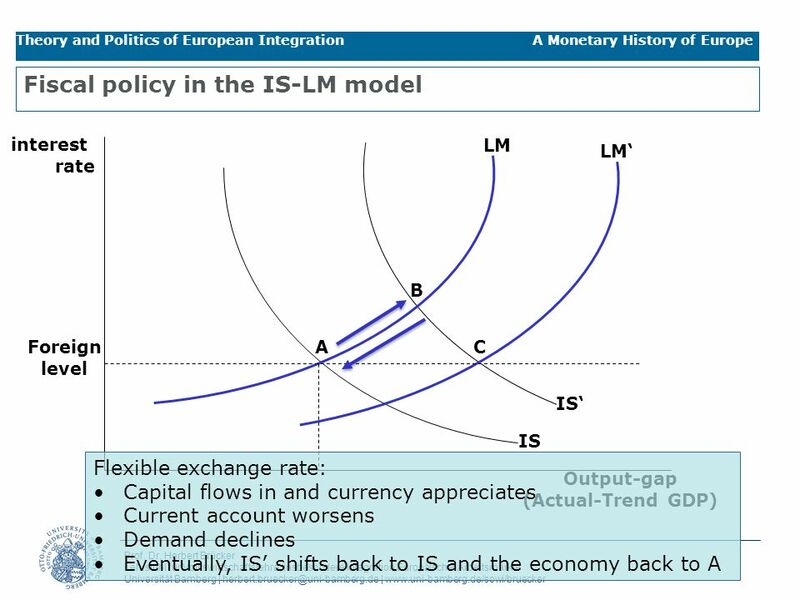 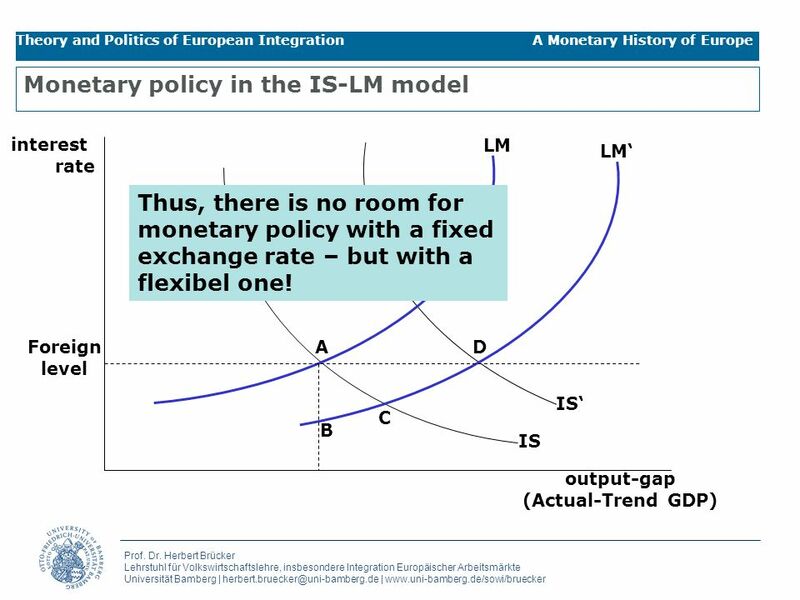 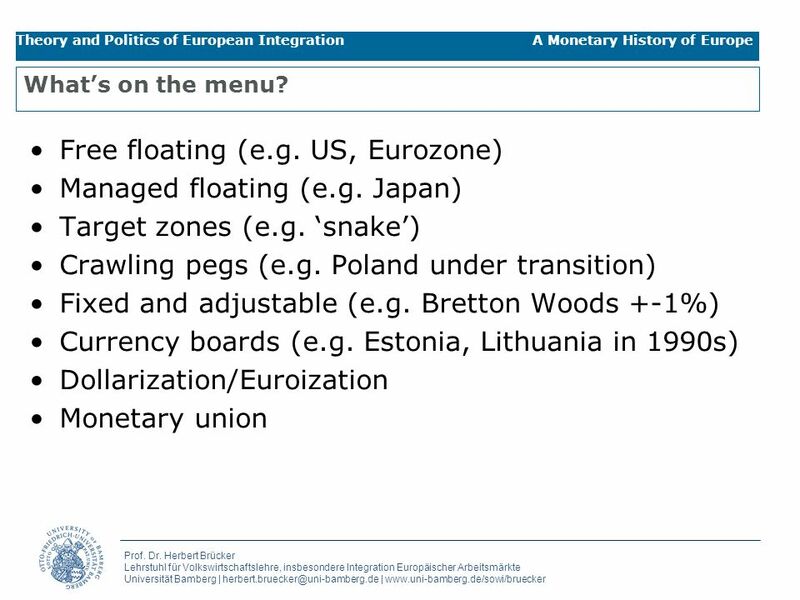 Theorie und Politik der Europäischen Integration Prof. Dr. Herbert Brücker Lecture 7 Open Economies Macroeconomics Monetary history of Europe Choice of. 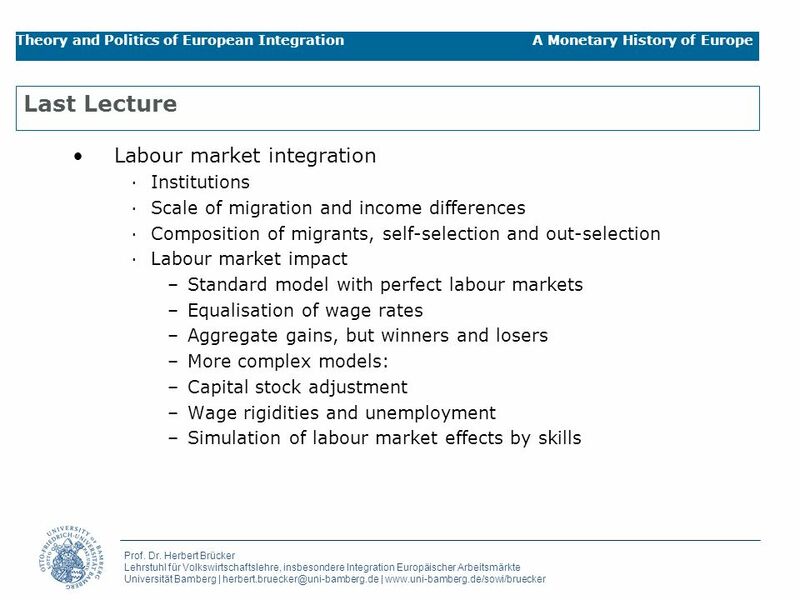 8 Prof. Dr. Herbert Brücker Lehrstuhl für Volkswirtschaftslehre, insbesondere Integration Europäischer Arbeitsmärkte Universität Bamberg | herbert.bruecker@uni-bamberg.de | www.uni-bamberg.de/sowi/bruecker Theory and Politics of European Integration A Monetary History of Europe The long-term neutrality of money: theory A B C AD long-term AS short-term AS output gap inflation rate 0 The AS-AD model output gap (Actual – Trend GDP) Aggregate Demand (AD): Why downward sloping? 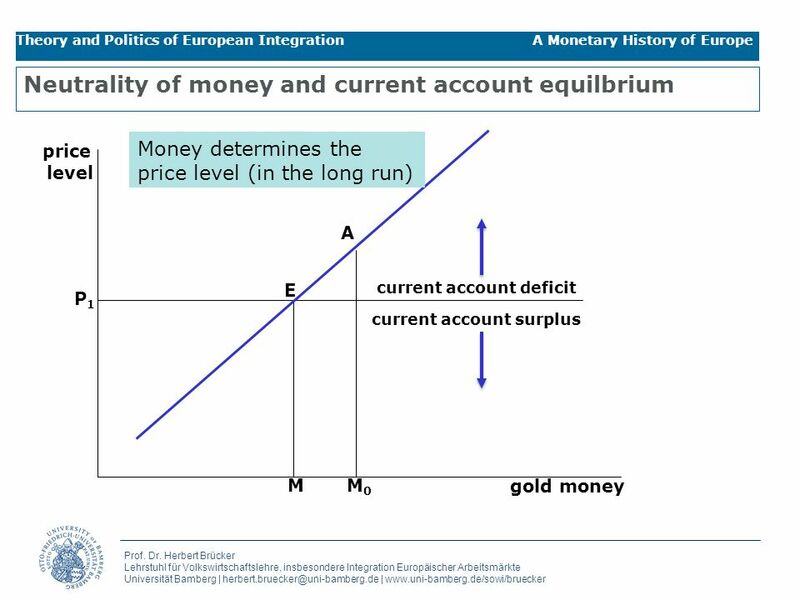 Inflation erodes purchasing power of money and discourages consumption (and investment). 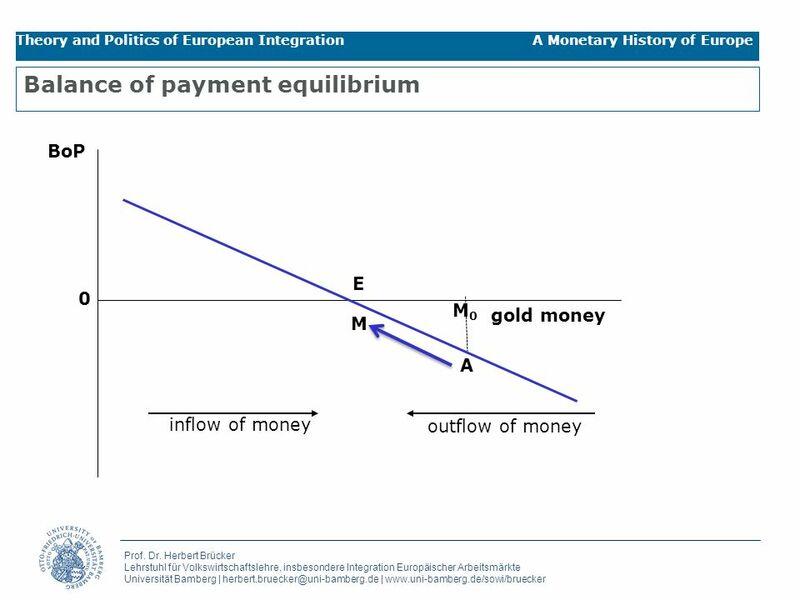 Hence, output is higher the lower inflation. 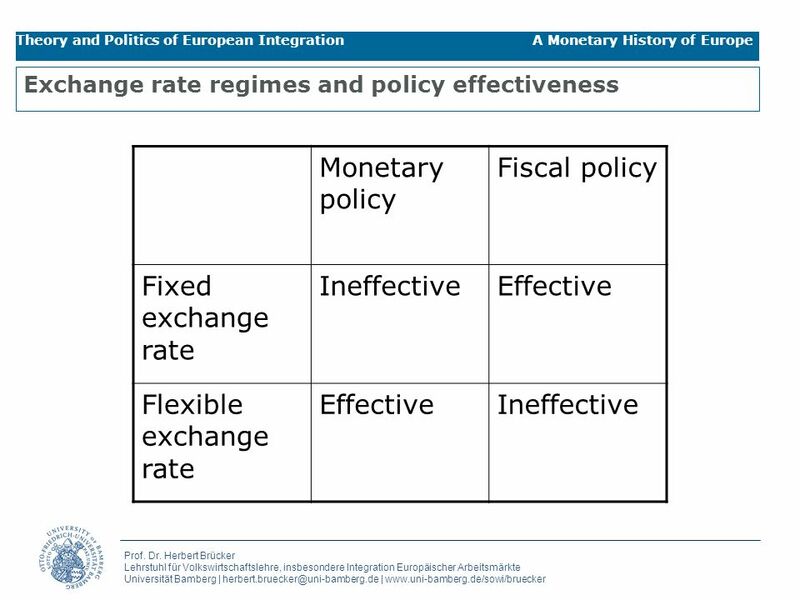 10 Prof. Dr. Herbert Brücker Lehrstuhl für Volkswirtschaftslehre, insbesondere Integration Europäischer Arbeitsmärkte Universität Bamberg | herbert.bruecker@uni-bamberg.de | www.uni-bamberg.de/sowi/bruecker Theory and Politics of European Integration A Monetary History of Europe The long-term neutrality of money: theory A B C AD long-term AS short-term AS output gap Inflation rate 0 The AS-AD model output gap (Actual – Trend GDP) Long-run: If prices rise faster than wages, purchasing power declines, creates wage pressure, eventually we move back to long-run wage-price relation at C.
18 Prof. Dr. Herbert Brücker Lehrstuhl für Volkswirtschaftslehre, insbesondere Integration Europäischer Arbeitsmärkte Universität Bamberg | herbert.bruecker@uni-bamberg.de | www.uni-bamberg.de/sowi/bruecker Theory and Politics of European Integration A Monetary History of Europe Monetary policy in the IS-LM model A C B D IS IS‘ LM LM‘ output-gap (Actual-Trend GDP) Foreign level interest rate Thus, there is no room for monetary policy with a fixed exchange rate – but with a flexibel one! 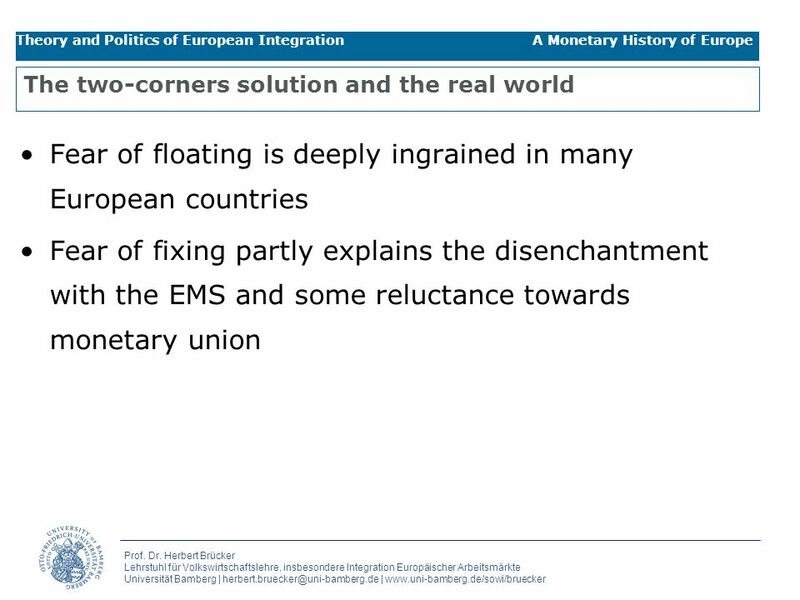 26 Prof. Dr. Herbert Brücker Lehrstuhl für Volkswirtschaftslehre, insbesondere Integration Europäischer Arbeitsmärkte Universität Bamberg | herbert.bruecker@uni-bamberg.de | www.uni-bamberg.de/sowi/bruecker Theory and Politics of European Integration A Monetary History of Europe A Monetary History of Europe Why studying history? 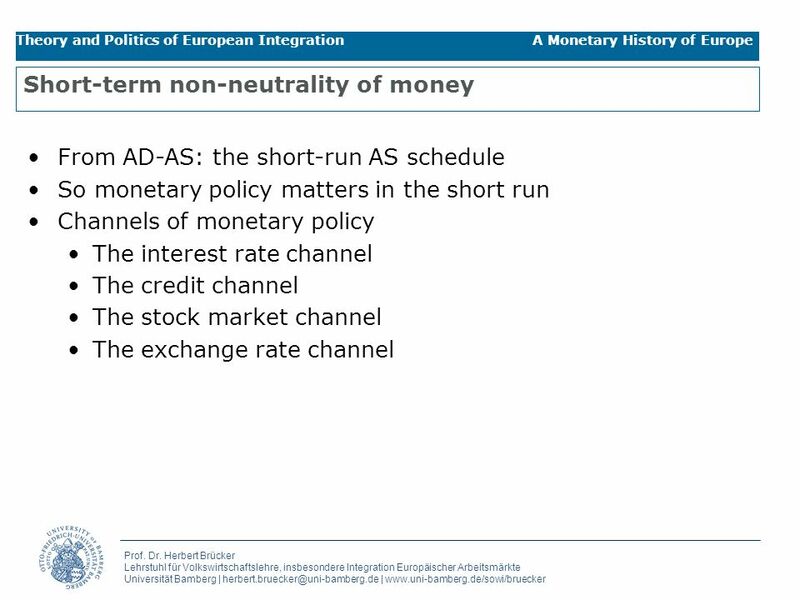 Monetary union is the controversial end of a long process. 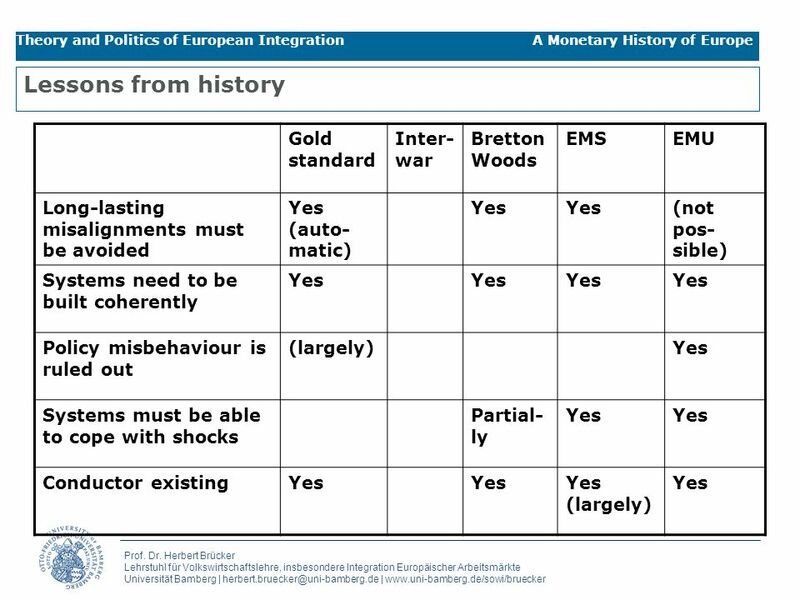 History helps understand. 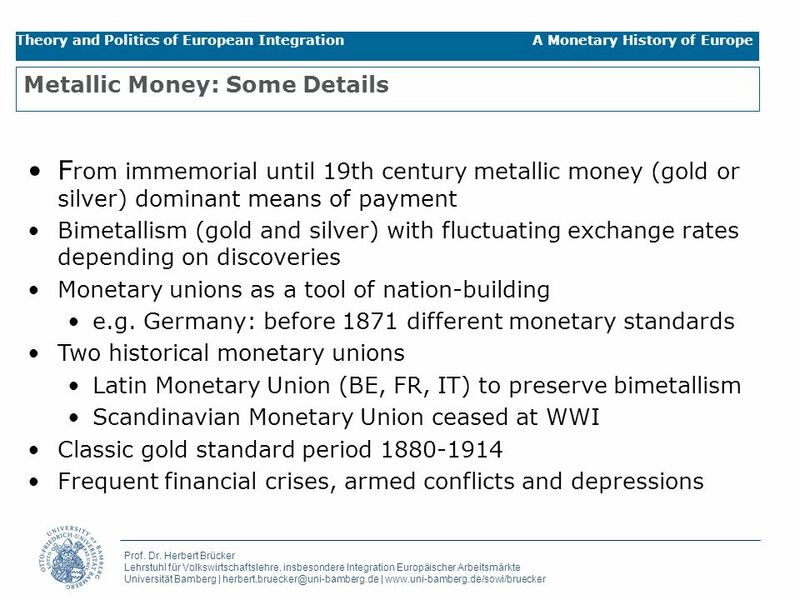 Since paper money was invented, Europe’s monetary history carries important lessons. 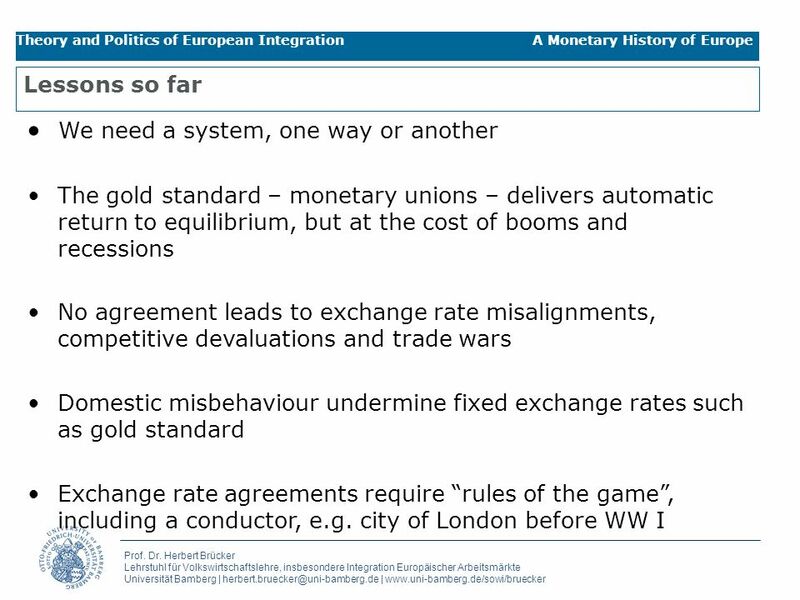 Particularly the bad ones. 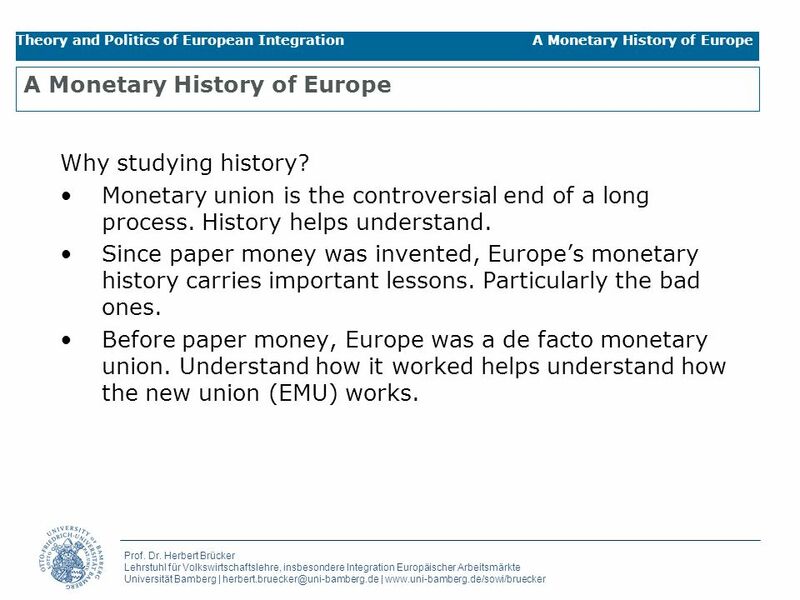 Before paper money, Europe was a de facto monetary union. 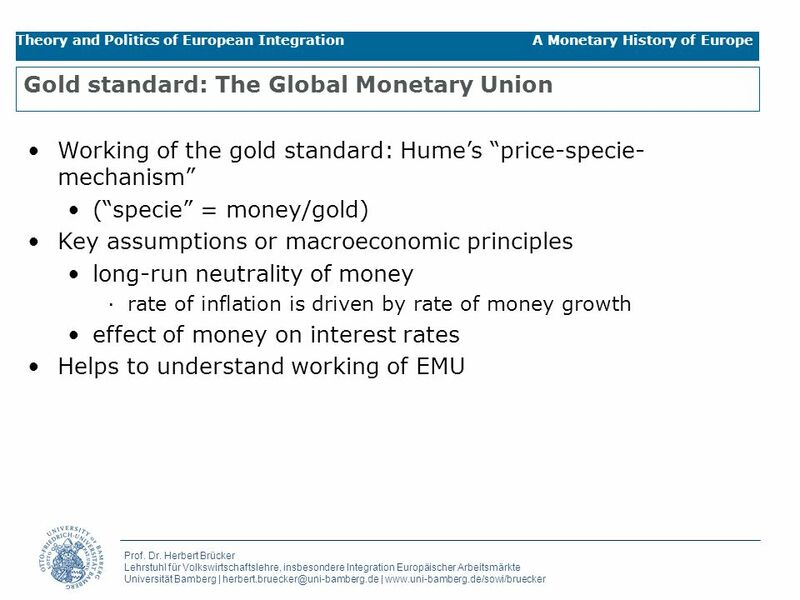 Understand how it worked helps understand how the new union (EMU) works. 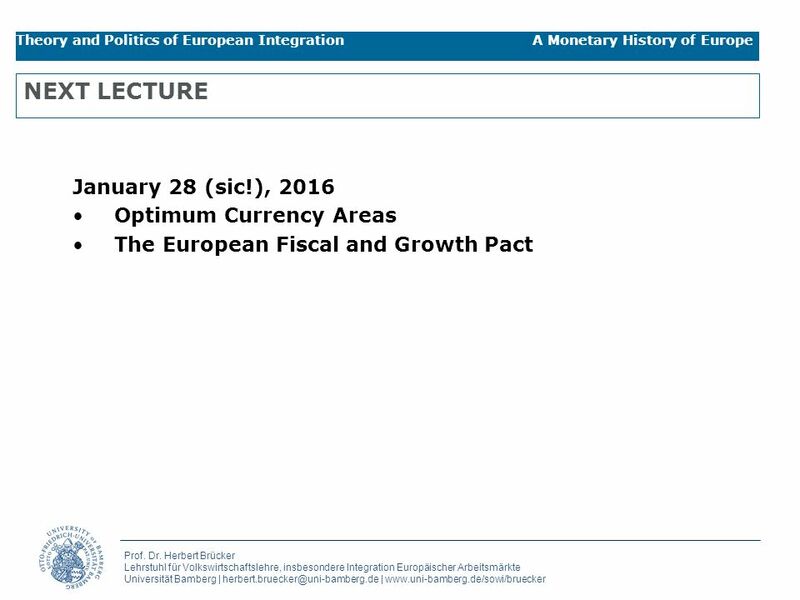 36 Prof. Dr. Herbert Brücker Lehrstuhl für Volkswirtschaftslehre, insbesondere Integration Europäischer Arbeitsmärkte Universität Bamberg | herbert.bruecker@uni-bamberg.de | www.uni-bamberg.de/sowi/bruecker Theory and Politics of European Integration A Monetary History of Europe Balance of payment equilibrium gold money 0 M EC M0M0 A outflow of money inflow of money BoP Hume’s mechanism: return to balance is automatic. 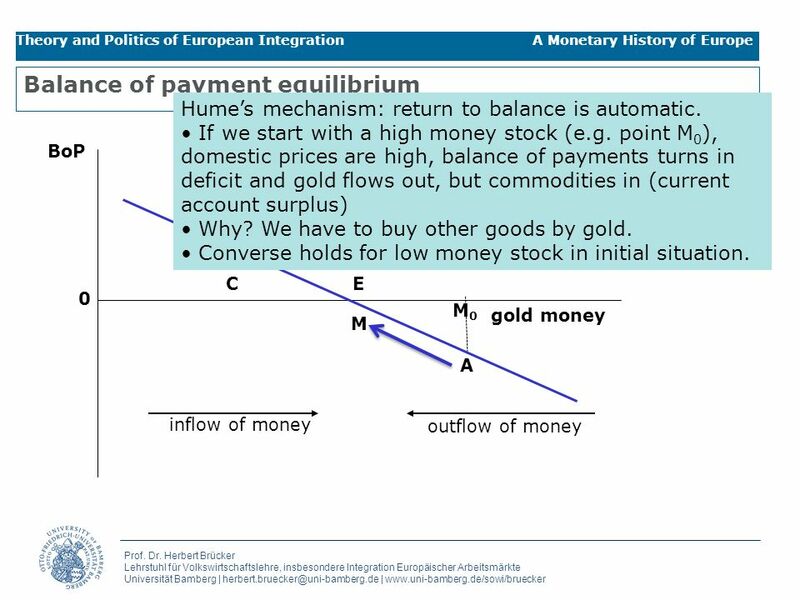 If we start with a high money stock (e.g. 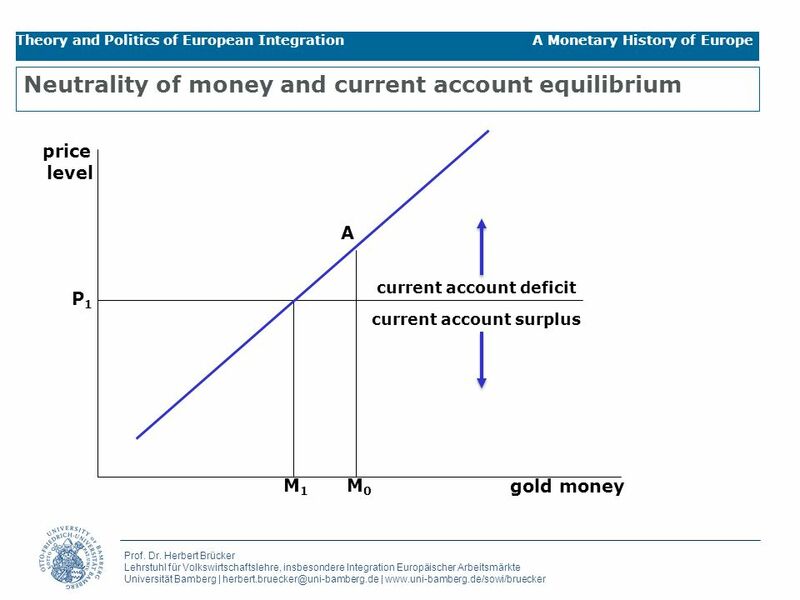 point M 0 ), domestic prices are high, balance of payments turns in deficit and gold flows out, but commodities in (current account surplus) Why? 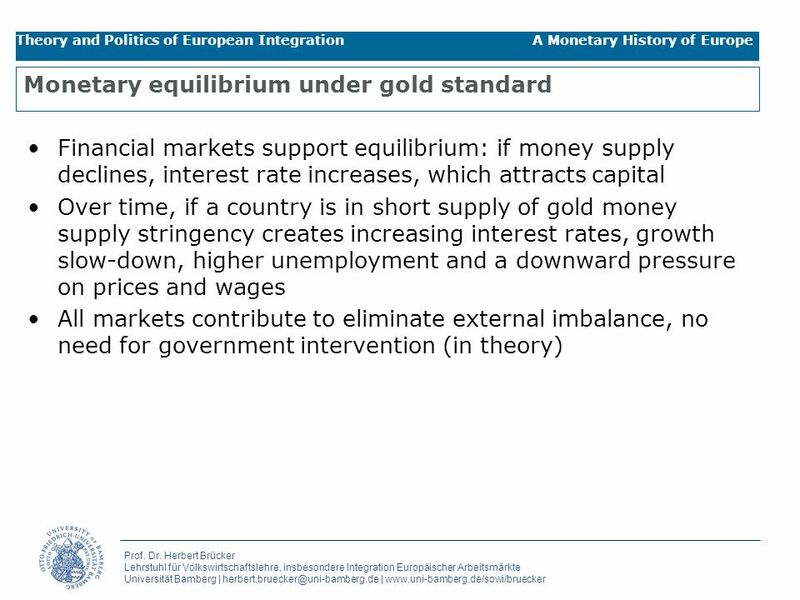 We have to buy other goods by gold. 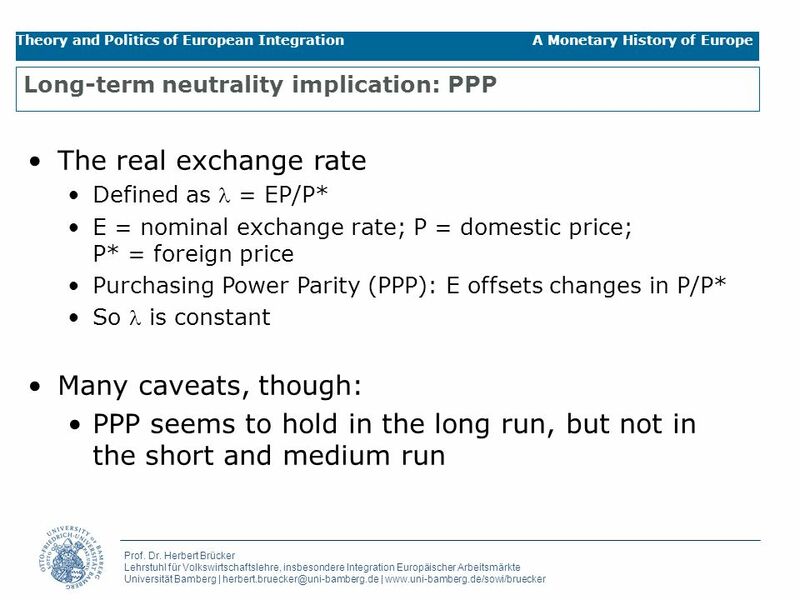 Converse holds for low money stock in initial situation. 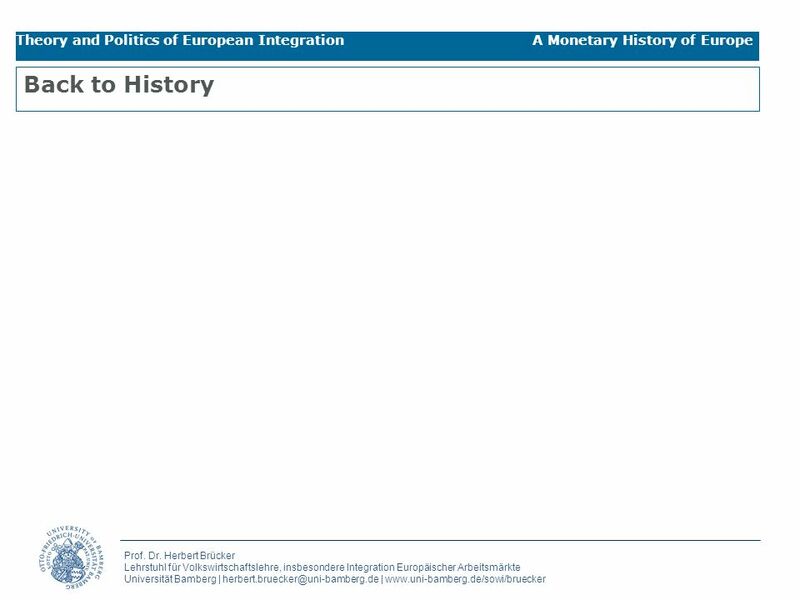 40 Prof. Dr. Herbert Brücker Lehrstuhl für Volkswirtschaftslehre, insbesondere Integration Europäischer Arbeitsmärkte Universität Bamberg | herbert.bruecker@uni-bamberg.de | www.uni-bamberg.de/sowi/bruecker Theory and Politics of European Integration A Monetary History of Europe Financial account equilibrium gold money interest rate i* MM0M0 A financial account surplus financial account deficit E Relation between financial and current account: Capital inflow requires high interest rate and increases in prices Both capital and current account deteriorate Trade route is slower, but both work in same direction In the long-term, capital flows equalise interest rates, current account adjusts, such that the current account, capital balance and BoP is in equilibrium. 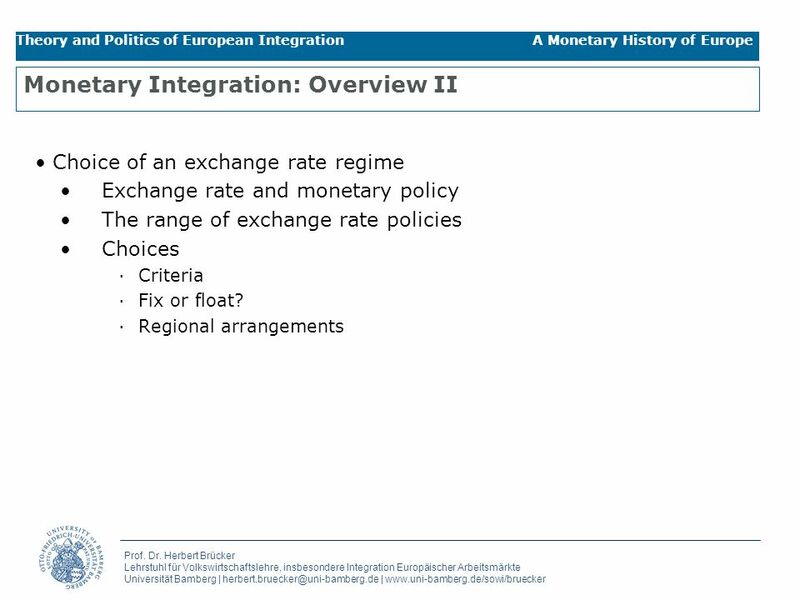 41 Prof. Dr. Herbert Brücker Lehrstuhl für Volkswirtschaftslehre, insbesondere Integration Europäischer Arbeitsmärkte Universität Bamberg | herbert.bruecker@uni-bamberg.de | www.uni-bamberg.de/sowi/bruecker Theory and Politics of European Integration A Monetary History of Europe Monetary equilibrium under gold standard Summing up: Money in excess of M translates into balance of payment deficits and gold outflows If money is in short supply (left of E = M), balance of payments is in surplus and gold flows in Point A may correspond to a point with imbalances in current and capital account, e.g. 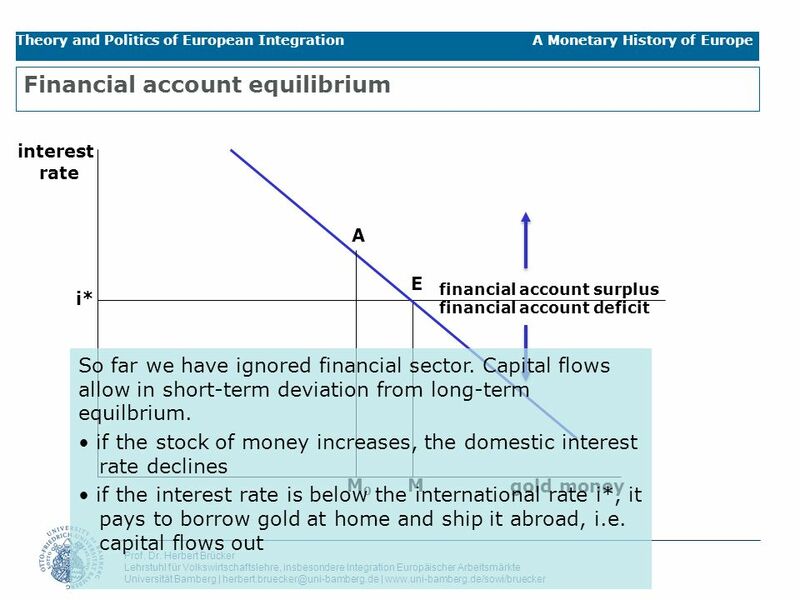 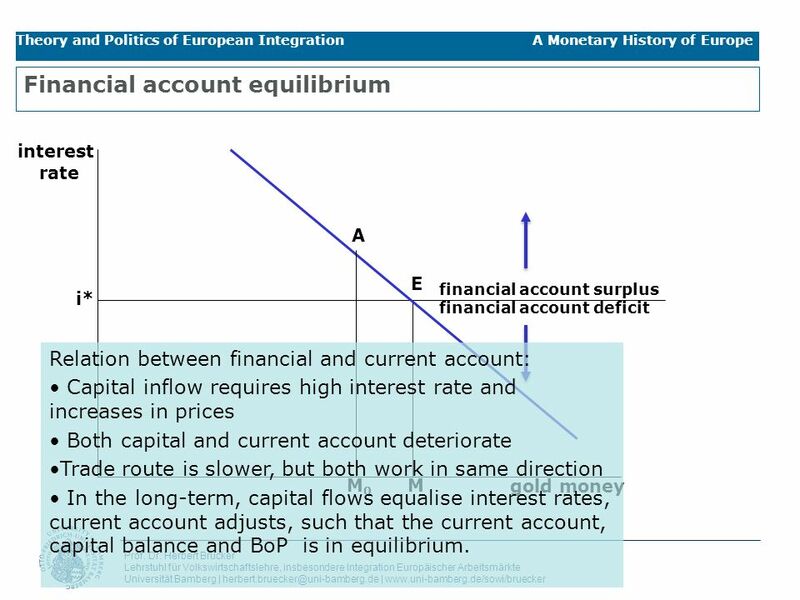 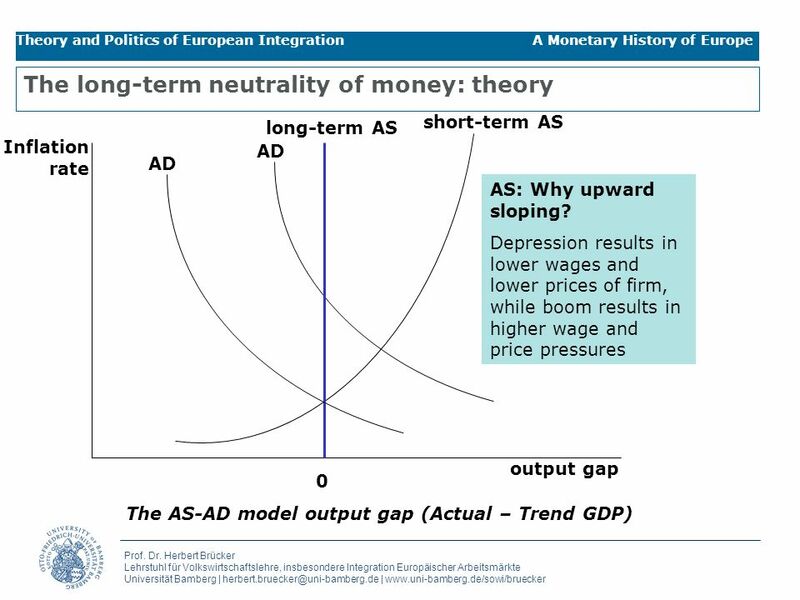 a point where the current account deficit exactly matches the capital account surplus This forms however only a short-term equilibrium since interest rates differ. 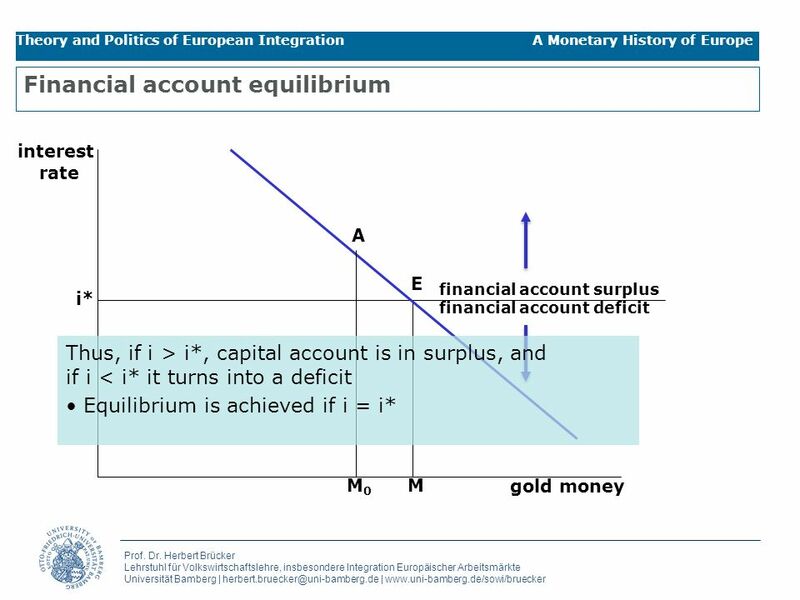 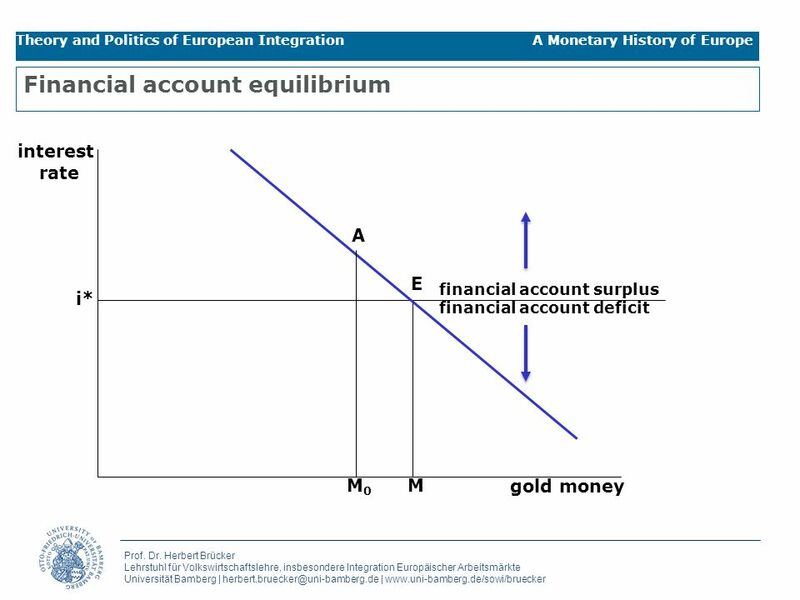 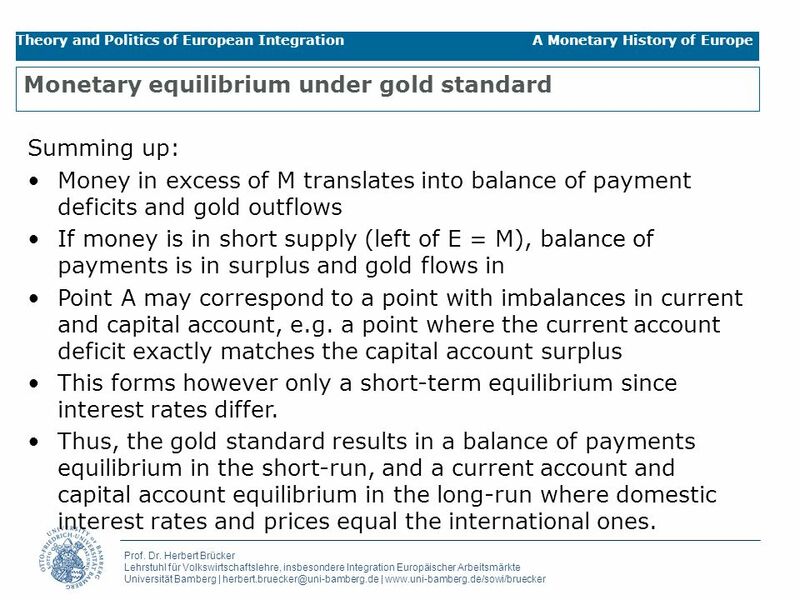 Thus, the gold standard results in a balance of payments equilibrium in the short-run, and a current account and capital account equilibrium in the long-run where domestic interest rates and prices equal the international ones. 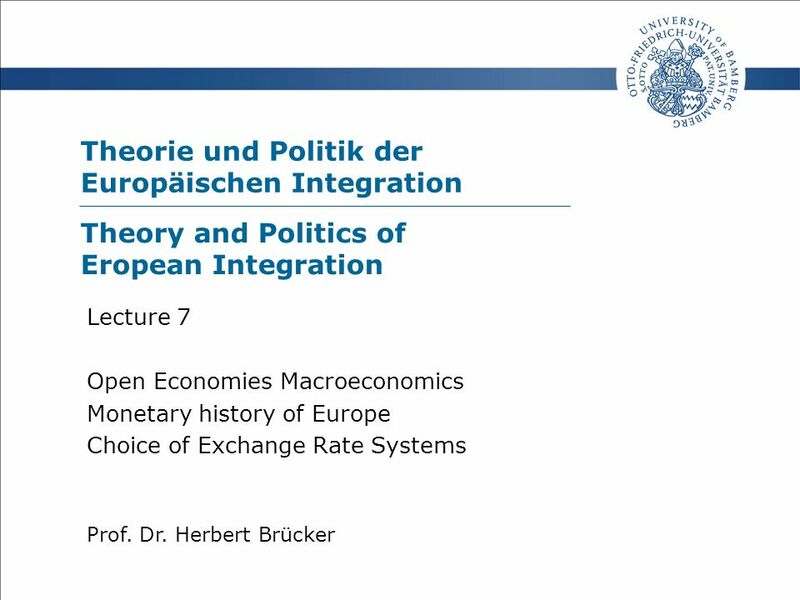 47 Prof. Dr. Herbert Brücker Lehrstuhl für Volkswirtschaftslehre, insbesondere Integration Europäischer Arbeitsmärkte Universität Bamberg | herbert.bruecker@uni-bamberg.de | www.uni-bamberg.de/sowi/bruecker Theory and Politics of European Integration A Monetary History of Europe The interwar period: three case studies  The British case: return to gold standard pre-war parity and refusal to devalue an overvalued currency relative to US breeds economic decline. 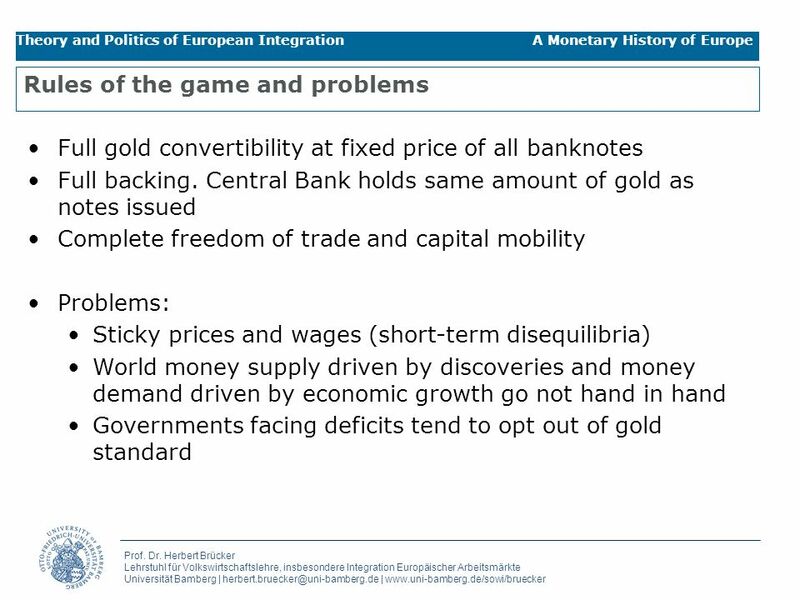 Abolished unsustainable gold standard in 1931 and devalued currency by 30%. 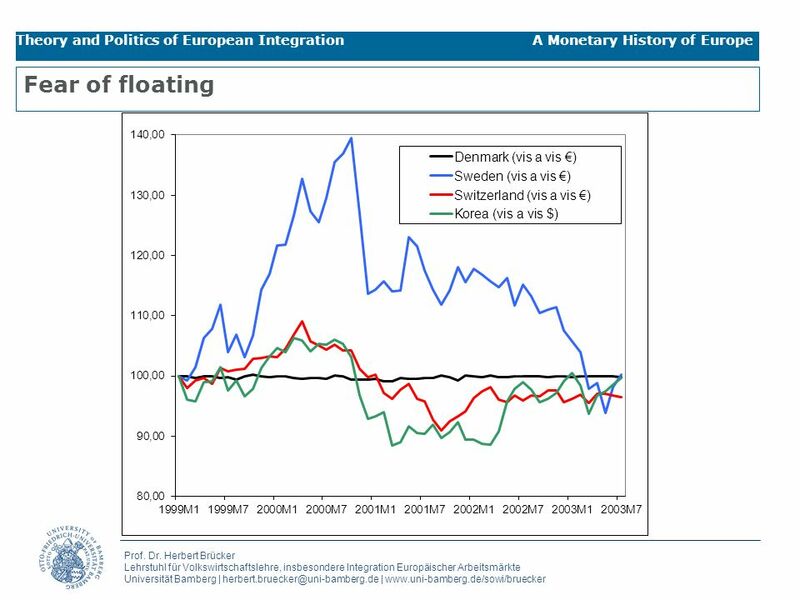 Cost: decade of miserable growth. 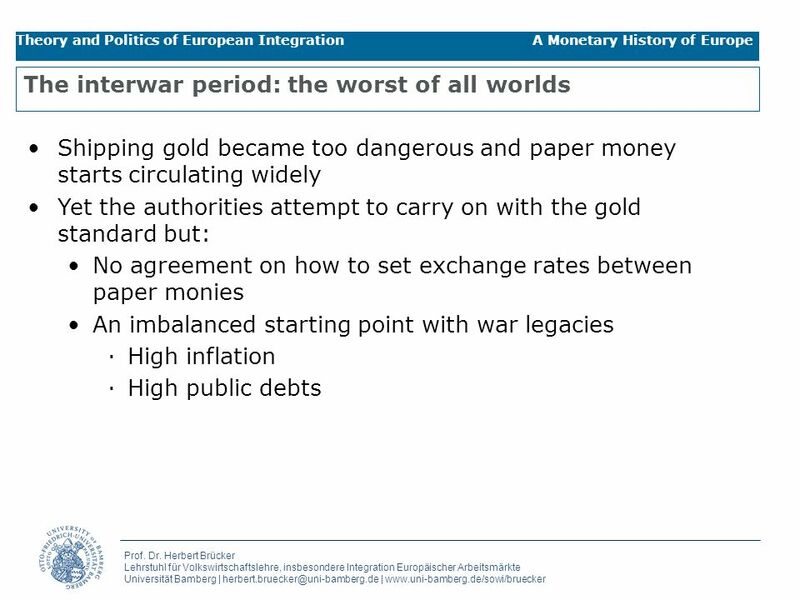  The French case: high debts hoping for German’s reparations, inflation soared after reparations failed. 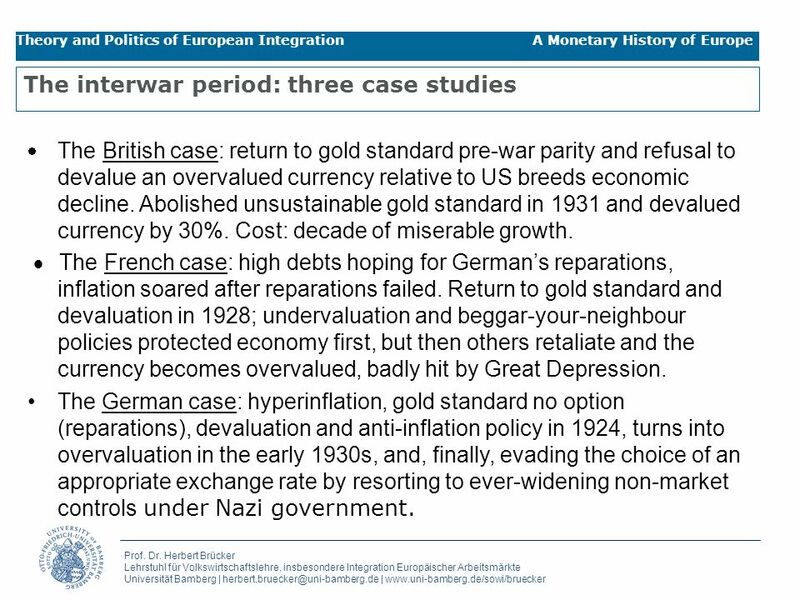 Return to gold standard and devaluation in 1928; undervaluation and beggar-your-neighbour policies protected economy first, but then others retaliate and the currency becomes overvalued, badly hit by Great Depression. 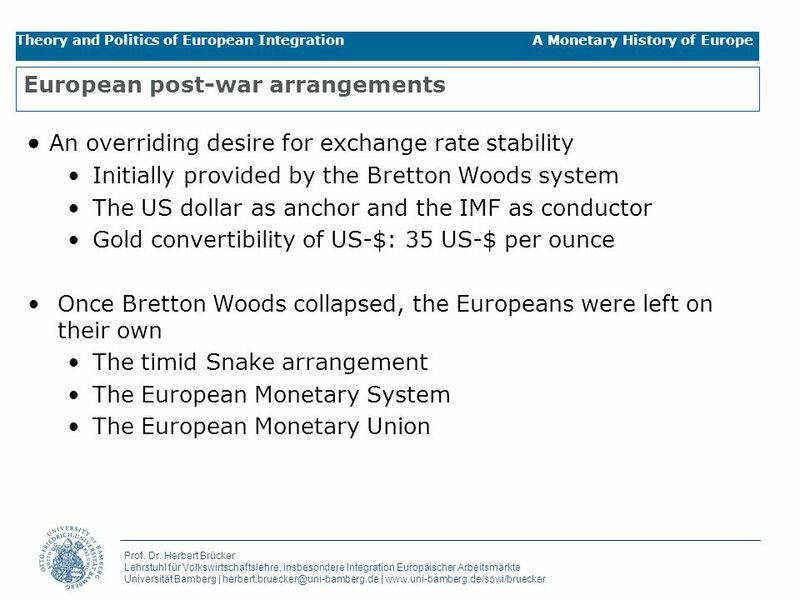 The German case: hyperinflation, gold standard no option (reparations), devaluation and anti-inflation policy in 1924, turns into overvaluation in the early 1930s, and, finally, evading the choice of an appropriate exchange rate by resorting to ever-widening non-market controls under Nazi government. 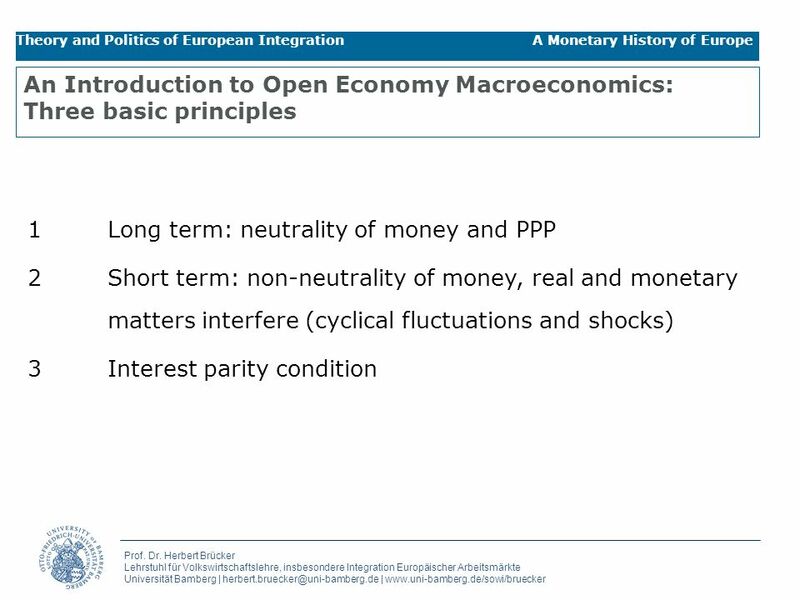 Herunterladen ppt "Theorie und Politik der Europäischen Integration Prof. Dr. Herbert Brücker Lecture 7 Open Economies Macroeconomics Monetary history of Europe Choice of." 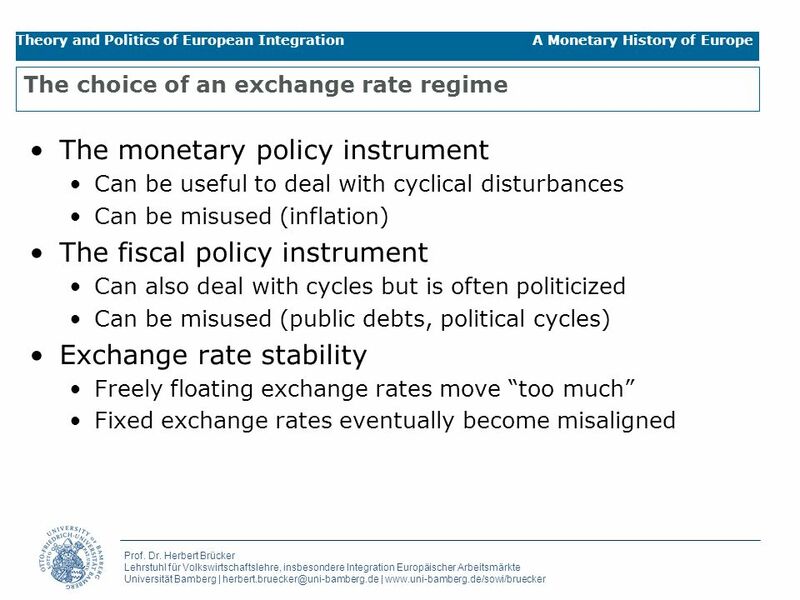 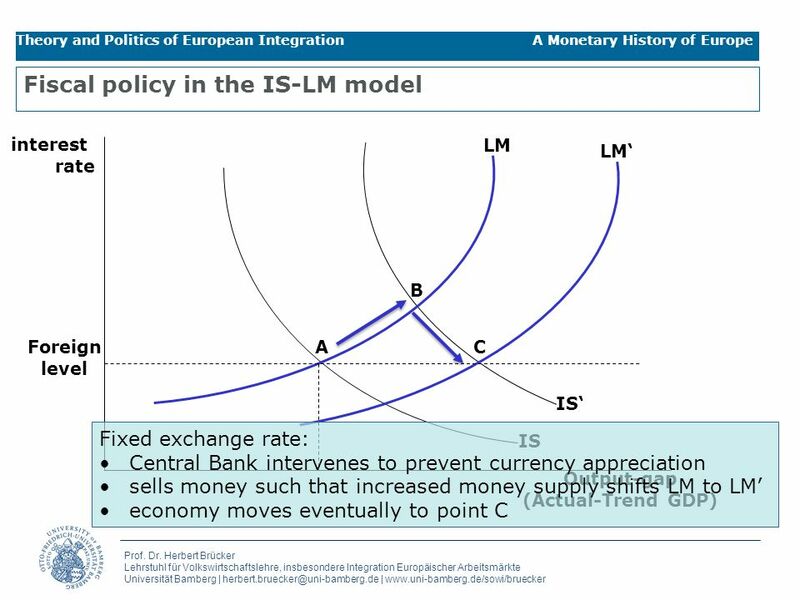 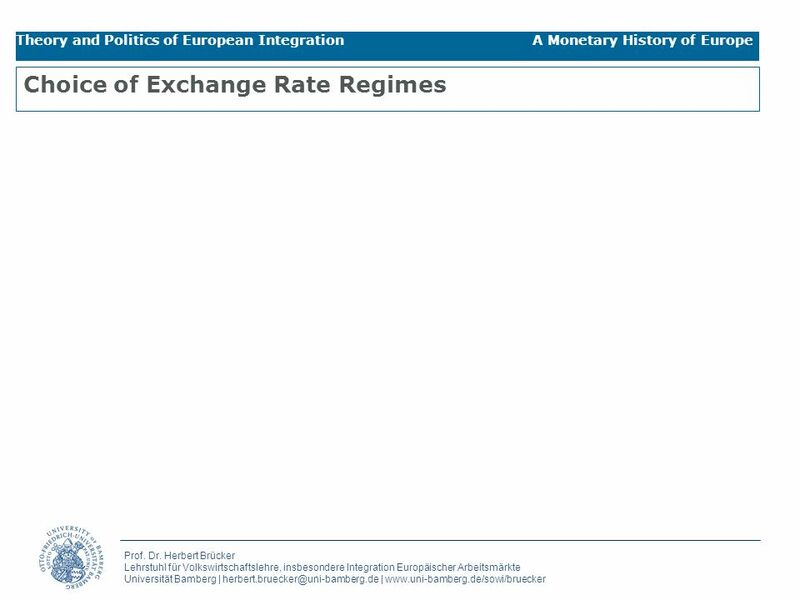 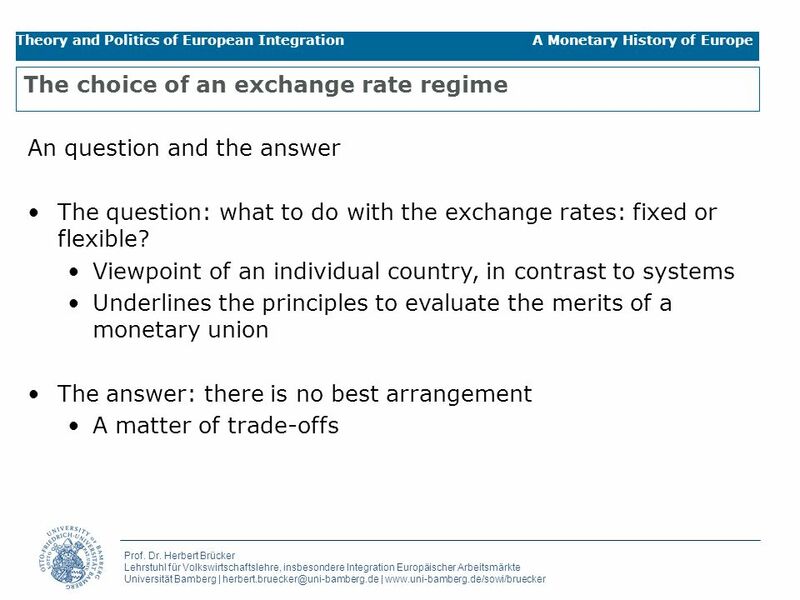 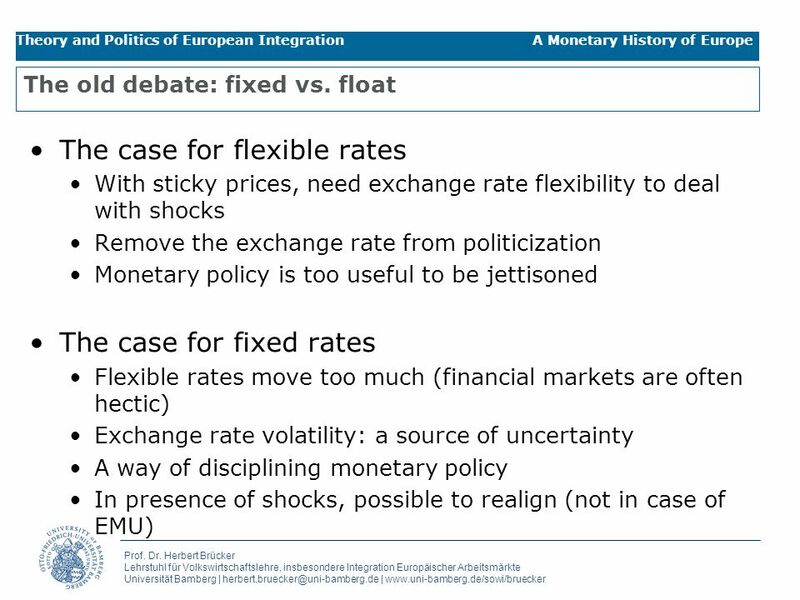 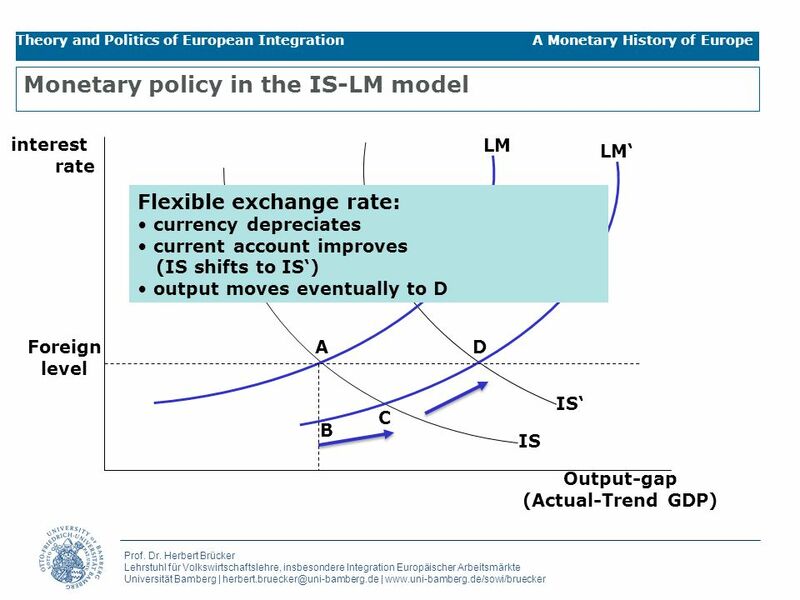 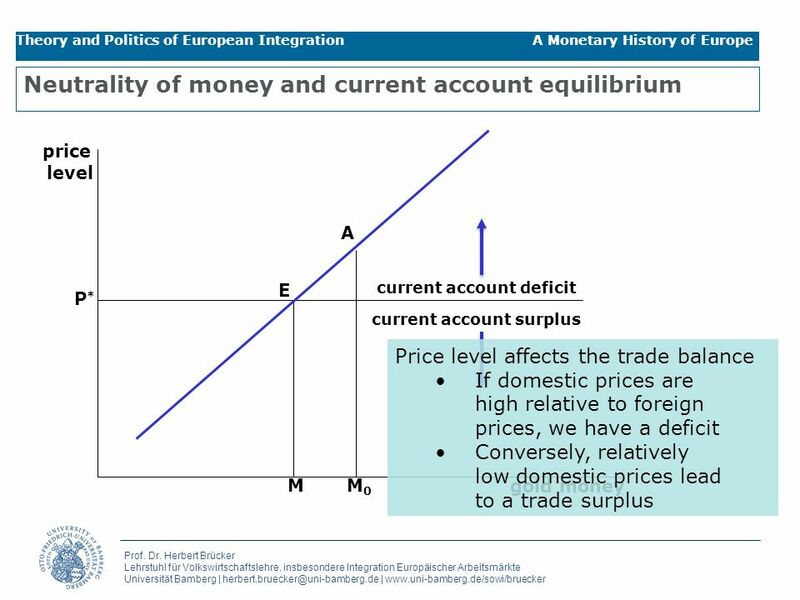 Theorie und Politik der Europäischen Integration Prof. Dr. Herbert Brücker Lecture 6 A Monetary History of Europe Choice of Exchange Rate Systems Theory. 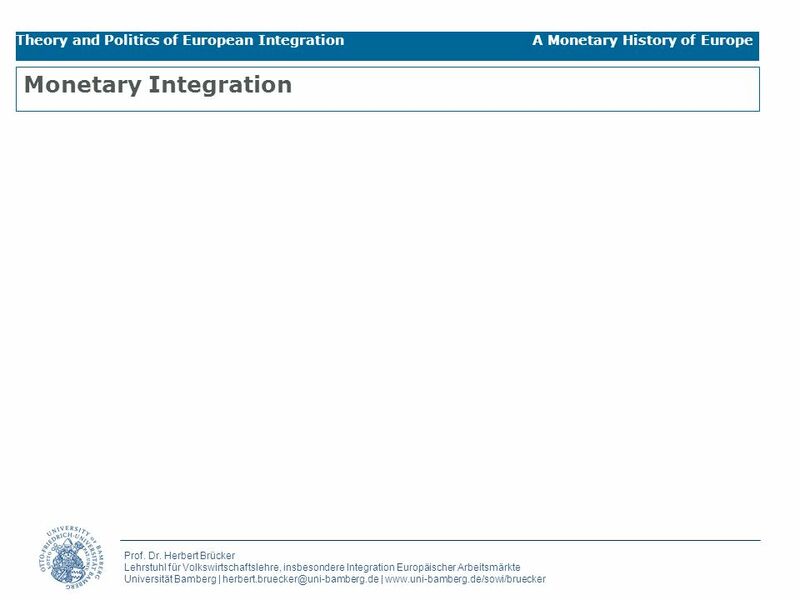 Three minutes presentation I ArbeitsschritteW Seminar I-Prax: Inhaltserschließung visueller Medien, Spree WS 2010/2011 Giving directions. 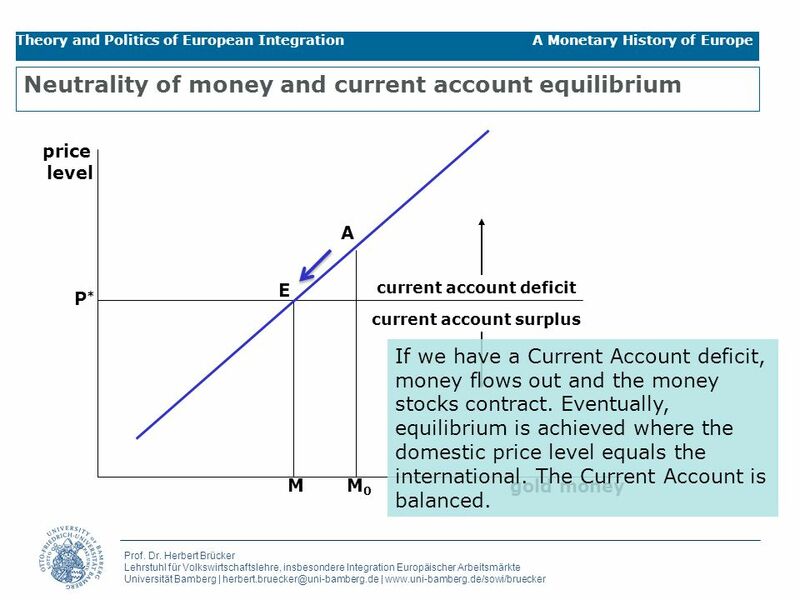 Relative Clauses… Putting sentences together in harmony. 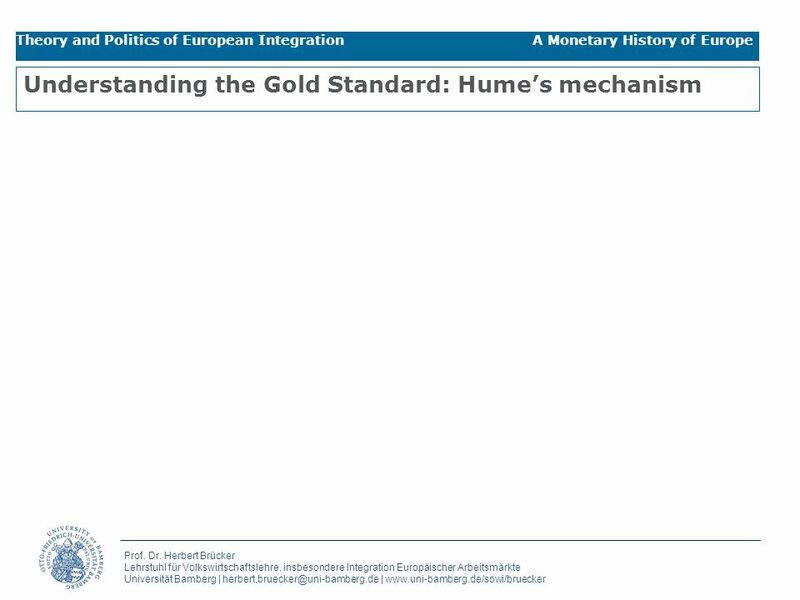 Laurie Clarcq The purpose of language, used in communication, is to create a picture in the mind and/or the heart of another. 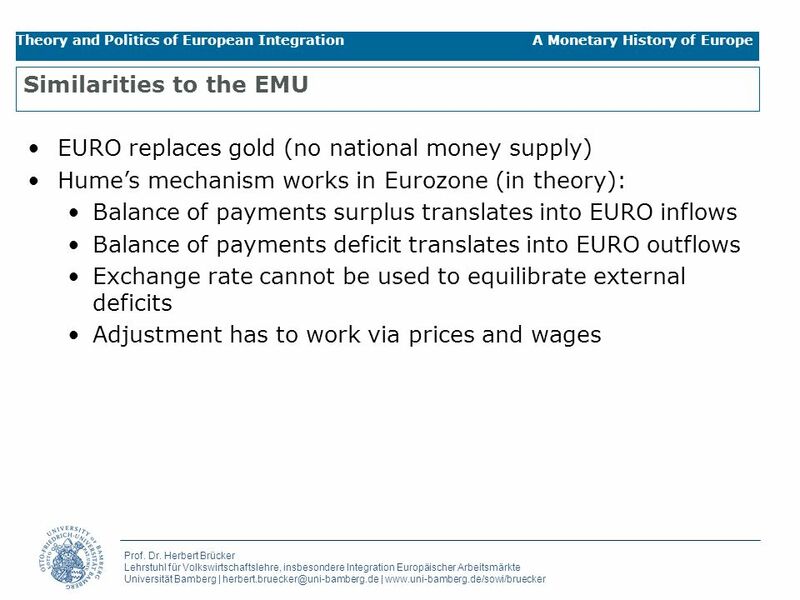 Theorie und Politik der Europäischen Integration Prof. Dr. Herbert Brücker Lecture 13 The European Monetary Union (EMU) Theory and Politics of European. 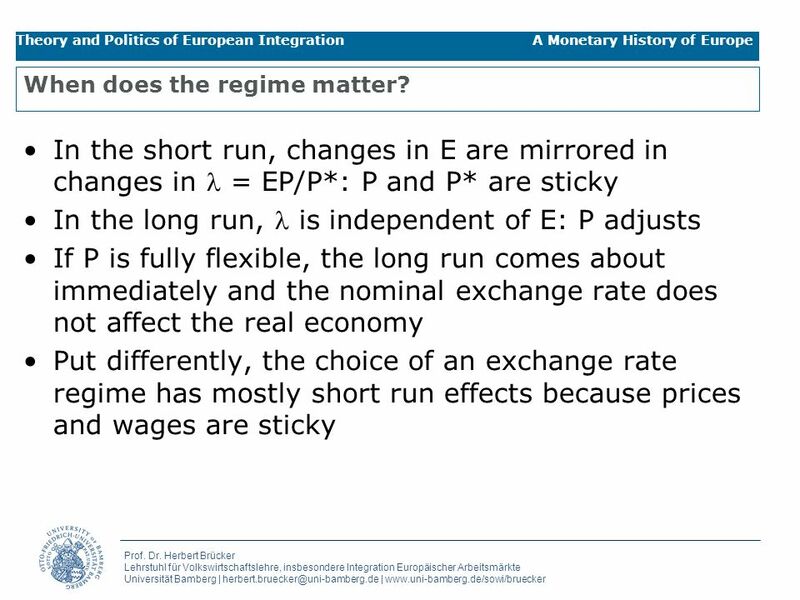 Theorie und Politik der Europäischen Integration Prof. Dr. Herbert Brücker Lecture 5 Preferential Trade Liberalisation Theory and Politics of European. 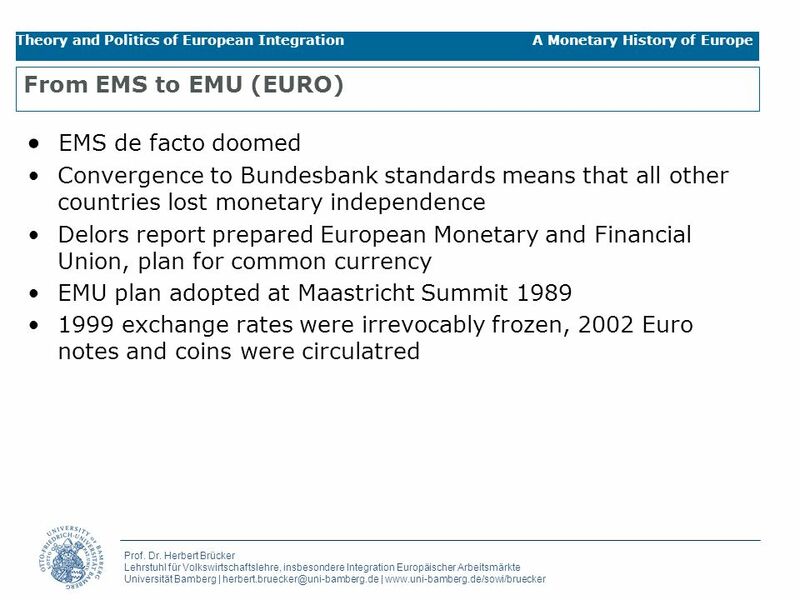 Theorie und Politik der Europäischen Integration Prof. Dr. Herbert Brücker Lecture 11 A Monetary History of Europe and the Choice of Exchange Rate Systems. 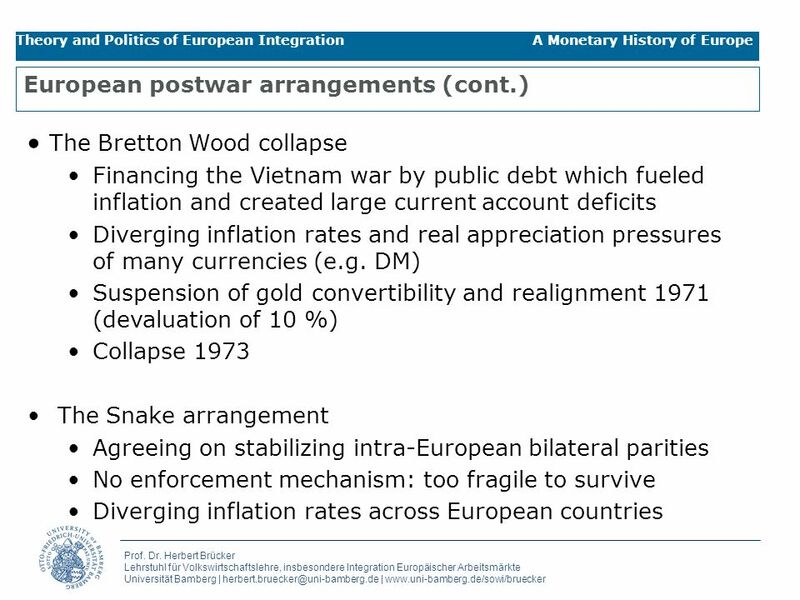 1 10 pt 15 pt 20 pt 25 pt 5 pt 10 pt 15 pt 20 pt 25 pt 5 pt 10 pt 15 pt 20 pt 25 pt 5 pt 10 pt 15 pt 20 pt 25 pt 5 pt 10 pt 15 pt 20 pt 25 pt 5 pt Modalverben. 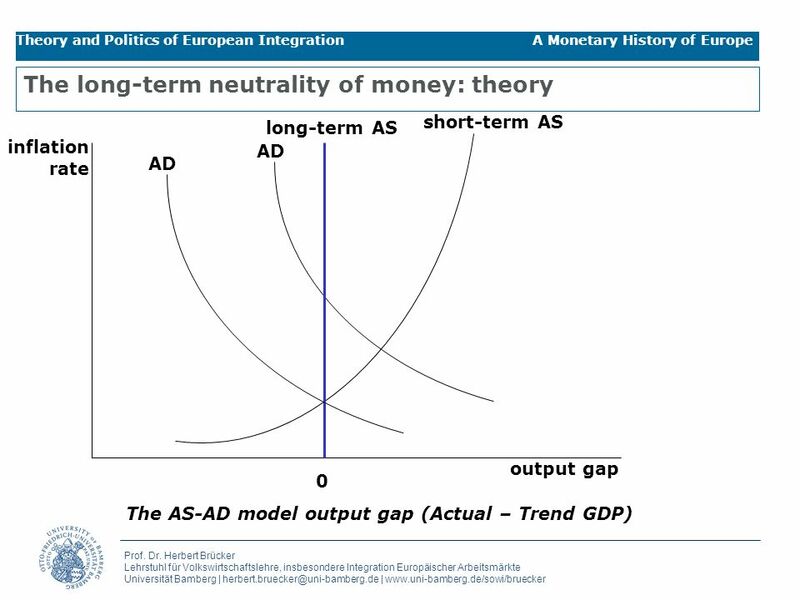 Steffen Lehndorff - Institut Arbeit und Technik / Forschungsschwerpunkt Arbeitszeit und Arbeitsorganisation Flexibility and control New challenges to working-time.